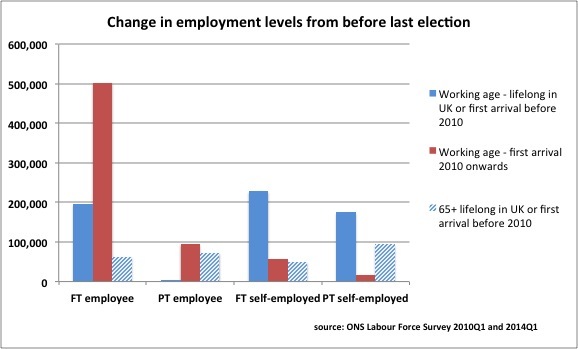 FlipChartRick blogged yesterday on labour market change just an hour or so before a weighty report from the government’s Migration Advisory Committee on the impact of low-skilled labour from abroad on the UK. The MAC report gives some explanation for some of the growth, which can be boiled down to saying that labour from abroad can provide a very attractive quality/price proposition to UK employers looking to fill low-skilled roles. That simplistic one-liner doesn’t do justice to the breadth and richness of the report which is about much more than narrow labour market issues and brings together all sorts of insights into the situation of migrants in low-skilled jobs in the UK. While this toleration makes for employers a ‘readily available supply of labour that is highly flexible, mobile and reliable’, establishing the actual labour market impact of this was beyond the scope of a report even of this size. The MAC restricted itself to a fairly short survey of the existing literature on the effect of all migration (not just low-skilled) on wages and employment as it is carrying out further research in these areas that it will report ‘in due course’. In the meantime, it noted that as far as pay rates go, the previous empirical research shows ‘overall the impacts found are modest and tend to be positive at the top of the wage distribution and negative at the bottom’. The list of sources is quite long but what is quite striking is that although these studies were variously published between 2005 and 2014, most use data covering periods only up to 2005. Even the very latest outlier uses data only up to 2008. So when people say migration has little/no impact on wages, by and large what they mean is that analysis of its impact found little impact in periods up until 2005. That’s some years ago now, and a lot has happened since. Against this background it’s interesting to take the recent ONS comparison of real wages and productivity and set this against the increasing proportion of people born abroad in the employed workforce. 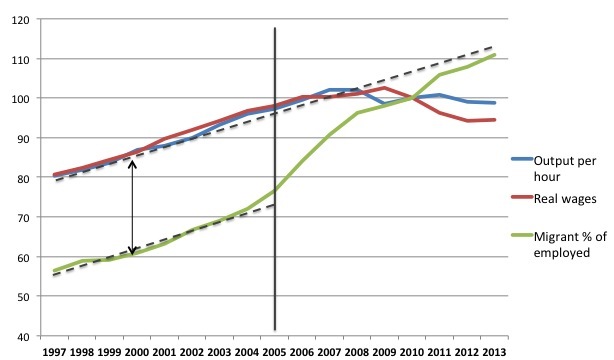 Following the ONS in indexing from 2010, the picture speaks for itself and shows a clear divergence between trend in wage and productivity growth on the one hand and trend in the migrant share of employment on the other from around … 2005. Having decoupled before the recession they do not appear to have started to recouple following the return of the economy to growth. Obviously this is at whole economy level, and so it doesn’t itself mean that migration has borne down on wages. It might be that wages have gone up in high migration areas and down in low migration areas. But it does suggest that whatever the result of more up-to-date analysis, it may well be different from the previous body of research in either direction, magnitude or both. It will be interesting to see what the MAC finds and whether this turns out to be one of the missing pieces of the productivity puzzle. Migration Advisory Committee report on the the growth of European Union (EU) and non-EU labour in low-skilled jobs and its impact on the UK here.